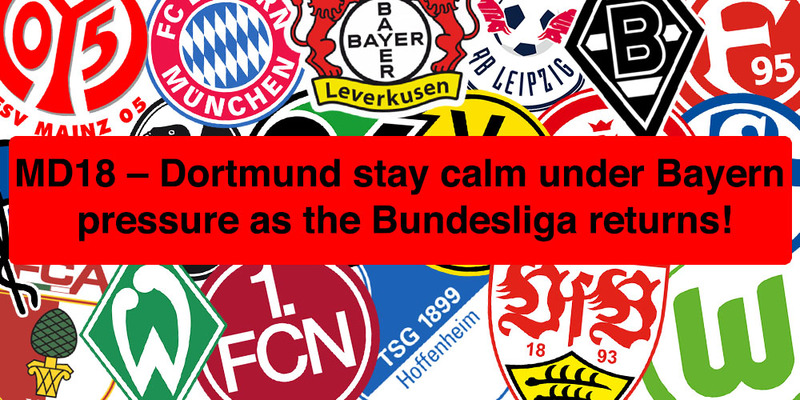 MD18 – Dortmund stay calm under Bayern pressure as the Bundesliga returns! Finally, after 26 days, the Bundesliga returned on Friday night! Hoffenheim and Bayern kicked things off, with the Bavarians winning 3-1. Despite their victory, however, the gap to leaders Borussia Dortmund remained at six points. BVB won 1-0 away at RB Leipzig in a game which they should have scored more. A good start, then, for both of the top two in this Ruckrunde. Matchday 18 also saw wins for Borussia Mönchengladbach and Eintracht Frankfurt. They beat Bayer Leverkusen 1-0 and Freiburg 3-1 respectively. It was Bayer Leverkusen’s first game under new manager Peter Bosz, with his reign getting off to a disappointing start. However, despite the result, there were plenty of positives to take from the game. They will hope that a change in management will enable them to climb the table, as we talked about in our review show last week. It was also another good week for Fortuna Düsseldorf, who won their fourth game in a row. This time, they beat Augsburg 2-1 to go seven points clear of the relegation play-off spot. Below them, Augsburg, Stuttgart, Hannover and Nürnberg continue to struggle. All four were winless this weekend as they battle for survival. With the Bundesliga returning, and plenty of actual football to talk about, there is no In Depth section this week. Don’t fret, however, as it will return in the next episode, with something special for our United States-based listeners, so keep an eye out for that!